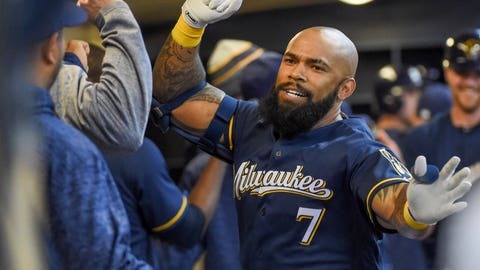 The Milwaukee Brewers gave their pitching staff a little bit of a new look Thursday during a busy stretch heading into the All-Star break, with less than stellar results. The Brewers (55-39) opened a five-game series against the Pittsburgh Pirates (44-49) at PNC Park Thursday with a 6-3 loss. Milwaukee was coming off a series at Miami that included a couple extra-inning games and taxed the bullpen. In addition to activating left-hander Wade Miley from the disabled list to start Thursday — he took the loss — Milwaukee recalled right-handed relievers Alec Asher and Adrian Houser from Triple-A Colorado Springs. Houser gave up four runs in two innings, while Asher pitched a perfect inning. The Brewers optioned right-handers Freddy Peralta and Jorge Lopez and infielder Nate Orf to Colorado Springs. He got into several jams in his last start, a 10-3 win Sunday against Atlanta. First baseman Jesus Aguilar started two double plays, among other defensive help the right-hander got as he gave up just one run in six innings despite allowing seven hits and three walks. Guerra is 1-1 with a 3.44 ERA in eight career games, six of them starts, against Pittsburgh. He took the loss in his only start against the Pirates this season, allowing six hits and five runs over five innings in a 6-4 defeat on May 4. He is 0-0 with a 2.81 ERA in four career games, three starts, at PNC Park.